There is a new stage production of A Kind of Loving by John Godber. It is premiering in March at the Wakefield Theatre Royal. There may be a lot of second and third-rate writers in the world, but there are a hell of a sight more second and third-rate readers. - Stan Barstow; August 1st 2001. 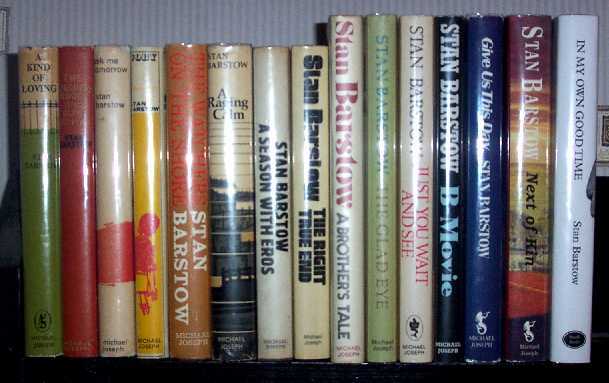 This web site is dedicated to the literature of Stan Barstow. His most famous work is his first novel, A Kind of Loving, and he has written eleven novels and three books of short stories, the majority of which are set in West Yorkshire, in the imaginary mining town of Cressley. With John Braine and Alan Sillitoe, he was one of the leaders of the "realism" movement of the early sixties. His books and short stories do not generally have heroes or villains, just normal people trying to get on with life and with each other in a normal world. I think the reason I particularly like the stories is because I can understand the motivation of most of the people in the books - I may not approve or agree with what they are doing, but I understand and can sympathise with why they are doing it. I have produced a separate page for each of Barstow's books (that I am aware of). Each page gives you the original publication date, a review of the book and other miscellaneous information about the book. Note that the review is purely my own opinion of the book - feel free to disagree with me! It is worth noting that Stan Barstow wrote two trilogies - and it is practically impossible to review the later books in the trilogies without giving spoilers to the early ones. I'll try my best - but you have been warned! For some of the books, I have given some information about availability. If I have written nothing, it means that the book is out of print, but not too difficult to find in second-hand book shops, either in hardback or paperback. (I have given links to the best sources of second-hand books on the internet.) Some of Barstow's books are still in print; some are getting quite difficult to find; I will indicate this where necessary. These pages are copyright © Martin Benson, 1999-2008. You are welcome to link to them.